Even experienced racegoers sometimes struggle to know exactly where the runners are at Fontwell Racecourse. This is due to the slightly confusing nature of its figure-of-eight course, which has different layouts for hurdles and chase races. Fontwell Racecourse can be a rather tricky place to find, but trips are usually well worth the effort on National Spirit Hurdle day in February. There are two tracks with the hurdles course a left-handed oval of around a mile. The chase track is a figure of eight and can often catch out inexperienced chasers. The racecourse is located on the A27 between Arundel and Chichester, close to the junction of the A27 and the A29. To Barnham. 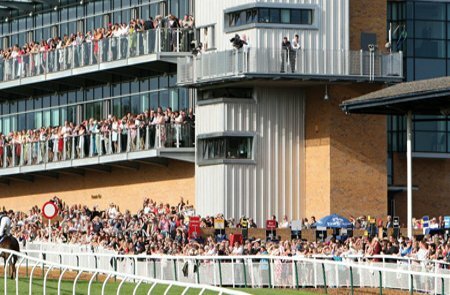 A free bus service between the station and the racecourse is in operation on race days. Punters flock to Fontwell Racecourse for a great day of horse racing, but if you cannot get there in person, you need to know about how you can place wagers and get the best odds on all of their races online. Therefore, we are pleased to present you with a variety of reputable online sportsbooks that allow you to place wagers on all of the races at Fontwell Racecourse from the comfort of your own home! Each of the online sportsbooks feature below offer some of the best odds that we’ve come across, so we’re confident that you’ll enjoy placing your wagers at each and every one of these great sportsbooks! One of the best places to make your wagers online is at Paddy Power. They are one of the oldest and most popular online sportsbooks, which is why we are happy to recommend them to all of our website visitors. Right now, Paddy Power is giving away up to $50 in free bets to all of their new customers, so click over to their website today to take advantage of this great offer! Click here to bet on Fontwell races at Paddy Power! Bet365 is another popular online sportsbook where you can place wagers on virtually every horse race imaginable; including all of the races at Fontwell Racecourse. This online sportsbook has a great reputation in the betting industry, both offline as well as online, which is why we are happy to recommend them to all of our website visitors. Right now, Bet365 is giving away $200 in free bets to all of their new customers, so check them out today to learn more about this great offer! Click here to bet on Fontwell races at Bet365! At Ladbrokes, one of the oldest and most trustworthy online sportsbooks, all new customers are currently eligible to receive up to $50 in free bets just for signing up! This is a fantastic promotion that you can use to place some high risk – high reward wagers without having to worry about the outcome of your bets! There’s no telling how long this offer will be available though, so be sure to visit Ladbrokes today to score your $50 in free bets while this promotion lasts! Click here to bet on Fontwell races at Ladbrokes! If you’re a big fan of the races at Fontwell Racecourse and you’d like to try making some bets on the races from the comfort of your own home, we highly recommend heading over to Bodog today! This online sportsbook has some of the best odds on virtually every race imaginable, including the races at Fontwell Racecourse, which is why we are always happy to recommend Bodog to all of our website visitors! Click here to bet on Fontwell races at Bodog!